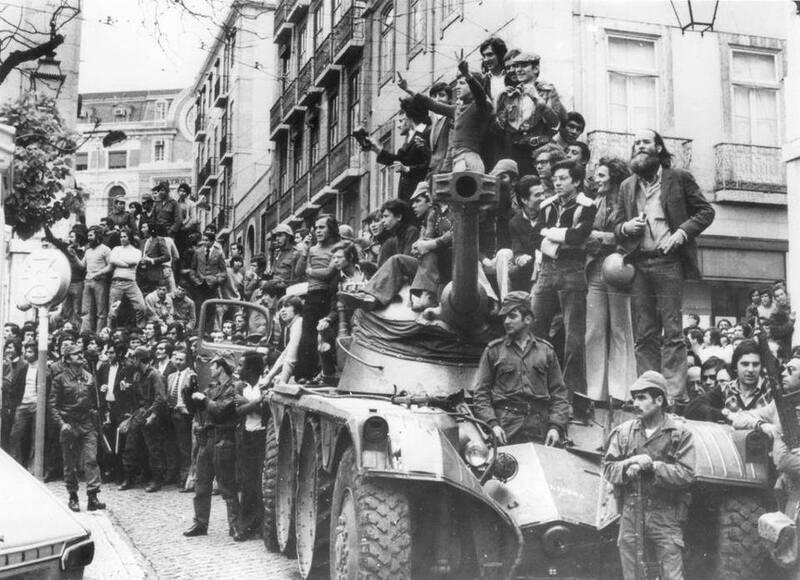 Phil Mailer of Solidarity's excellent history and analysis of the Portuguese Revolution from 1974-1976.
it is a PDF, 297 pages, and maybe someone wants to put it up here? if so, contact me via PM. bioport - thanks for that. I had noticed there was a problem with scanning errors. Hopefully someone will volunteer to put it up here and correct any remaining errors. I think this is particularly important in the light of events in North Africa. As I've said on the Tunisia thread I believe there are parallels between the revolution in Portugal and the ongoing revolution in Tunisia and this is the best source on Portugal I've found in English and from a libertarian perspective. ohhoho-careful careful Mark. what do you know about the carnation "revolution"? only yesterday i had a conversation with a historian and we both agreed on if there would have been elections on April 23, 1974, Salazar would have won them by any absolute margin. that's for one. two is that "the people" had short of nothing to do with the "revolution". it all happened within a small circle of the military in Lisboa--but influencial enough to have spread to the army at large. Portuguese don't like to hear these truths and in particular not the PCP! already Mailer in his book wrote about the "revolutionary folklore" that by the end of 76 had substituted any substantial effort to resist the return of the capitalist system, only now showcasing under the umbrella term "democracy". having said that, i believe Tunesia, Egypt and maybe also Yemen have pretty much nothing in common with the Portuguese tide of events of 74. the conflicts in Middle East countries are very _very_ multi-facetted and for some of the layers i have deep doubts that we were even able to recognize, leave alone judge and put them into context from our distanced couchpotatoe asses. in the current events it all starts with hunger, yes, hunger! that seems to be the only moving motive left for social change--or has it always been? like Brecht said: "erst kommt das fressen und dann die philosophie". just look at all these "crisis" that have befallen us in "the west", only during the last 2 years. wasn't there plenty enough of mindboggling injustice, deception or what fraud have you around, for which each and everyone had and will have to pay far into the future? and what happened? what happens? people turn the page: on their i-pads, pal, and they go look for an other toy. and don't you exclude you and me! bioport - I'm not arguing that the carnation revolution itself was anything other than a coup by part of the armed forces. Still, without knowing the details, I'm sure Ben Ali's exit in Tunisia came after an ultimatum from the army and wasn't just the result of the UGTT calling a 2 hour general strike. What I am suggesting is that there are parallels between the situation in Tunisia following 14 January and the situation in Portugal following 25 April, beyond the obvious one of the army being in effective control after ousting a dictator. I'm open to argument about this though. Edit: By the way, are you from Portugal? A re-print of a Portuguese translation of Phil Mailer's book is being prepared, in case anyone's interested. that "the people" had short of nothing to do with the "revolution". it all happened within a small circle of the military in Lisboa--but influencial enough to have spread to the army at large. Sure, it started like that, but as the book clearly says, it spread to the workers and to some extent the peasantry (though for the most part they seem to have remained a conservative force). The fact that democratic capitalism created a "revolutionary folklore" about it doesn't alter the fact that there was a genuine movement towards some form of worker's democracy, limited as it was. All breaks with the past, whether mass initiated or initiated by a would-be ruling class that then fulfills its own wishes (or, more usually, combinations of the two), create a "revolutionary folklore" (the French Revolution, the Russian revolution, etc.) but that shouldn't detract from the fact that part of these movements genuinely searched for a far wider struggle for freedom than merely one permitted by a change of the rulers. That said, the parallels between Portugal '74 -'75 and Tunisia today seem, as I've said before and elsewhere, not very useful: so far, there don't seem to have been any occupations or even many strikes of workplaces in Tunisia; and yet the rioting and attacks on public buildings in Tunisia are far more significant and angry than anything that happened on this level in Portugal (as far as i remember - haven't read the whole of the book since the late 70s - nothing happened like this there). well, you have reason to disagree, and i'll probably be a great deal with you on that. but that would be a long discussion. what i find most striking conc. the Portuguese events of 74 are two things: the sudden energy which afflicted the Portuguese workers and peasants after they realized the historic occasion and the sudden asphyxiation of exactly that energy over the span of appr. 2 years. although what happened here was quite unique, it is this from which the real lessons can be drawn: the relation between the original revolutionary energy and the parties/individuals that slip (themselves) into leadership positions, meaning, the ideologic positioning of any progressive movement. in history, practically all ML implementations flopped badly--and at times even disgustingly so. anarchism has never found an adequate solution to this problem--maybe because it is excluded by definition. but here lies the dilemma. at some point of its creation i have had the feeling that the notion of "grassroots" had some anarchic backthought--voluntary or unvoluntary--only without the "radical" that is suggested by the term anarchism. it proposes a participatory attachment of each and everyone to the political process. however, it needs to be taken into account, too, that "grassroots" is indeed a "modern" word, simply because its idea is inextricably connected to the state of technical development, the possibilty to reach every single citizen seperately via communication technology--which certainly did not exist at the times when the idea of political anarchism was formed. unfortunately the concept of "grassroots" has already been driven into the garbage by the (ab-)use of reactionary groups. and here we are back in the future, the actual events in the ME. again i have to agree with fantomas, there is practically _no_ parallel between Portugal 74 and the ME now. but not only for fun i mentioned the modern notion of "grassroots". it seems to fit much better than anything else at hand, because, as i said before, it is about hunger and does not only concern the "working class" (whatever that is today ... e.g., who is the "lumpenproletariat" in the ME? the majority?) it concerns every single individual in, now, Egypt, shortly before and ongoingTunesia. don't forget that there have already been the famous riots in Egypt in 2005, and they were about food, too! to Mark: no i am not Portuguese, i only have been living in Lisboa for quite some years. and i am working (with others) on a project about the PIDE after 74. No, it's a reprint of the English version, isn't it? Details here of the reprint scheduled for June 2011.